I’m certain these pitfalls are not systemic. They don’t arise because consensus is a flawed concept. These myths take hold because so few of us see consensus practised well, including Sarah Maddison I suspect. Groups take all manner of shortcuts or press to a vote because of time constraints. Conflict is tricky. Sometimes our own fears or doubts get in the way of a clear-headed approach. The Groupwork Institute collaborative decision-making model I use takes account of these traps and actively helps groups to avoid them. For example, by making every effort to raise, pool and examine all the issues we become familiar with all the fine details of the terrain. By encouraging contributions from everyone with an interest, and by listening to and respecting all ideas, we ensure people feel heard and included. 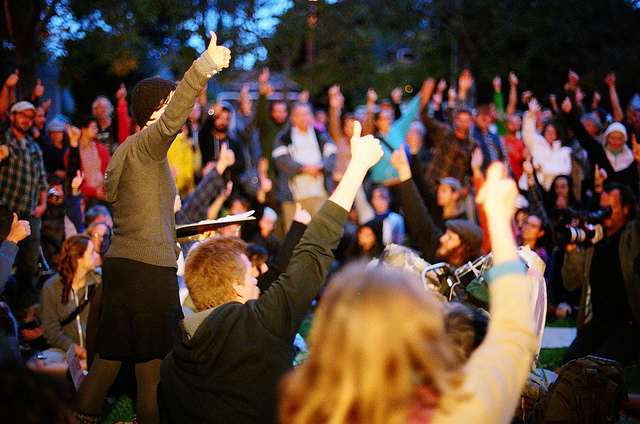 By showing compassion and goodwill to anyone who finds themselves swimming against the tide, we normalise unfamiliar or unpopular opinions, rather than alienating them. When we incorporate all these strategies we build a strong foundation for a decision because we have taken account of all views. This is the dealmaker for me about consensus: the process must be proactively inclusive and must genuinely welcome all points of view. Many poor decisions stem from good ideas being lost. We can too easily overlook or dismiss important considerations because of unspoken cultural, ideological or personal blind spots. For Maddison this gentler and more inclusive approach is a gift from the agonists. Wherever it comes from, for me it’s the very bedrock of good consensus practice. The aspects of Maddison’s critique that rang the truest for me are our two great Achilles Heels (to make a plural out of something that’s singular): speed and power imbalances. Yes, we are sometimes slow at arriving at a decision via consensus – although I haven’t seen any comparative data that supports the feeling that consensus is slower than other methods. When we are slow, it’s mostly for two reasons. The first is what I call the safety pause. This is when, at critical junctures where we hit an impasse or a flaming hot spot often the most natural and helpful thing to do is to slow things down. These delays can be frustrating but they serve a group well by allowing its members the time to absorb new information and to understand any passions or emotions that are attached to our ideas. I think the main reason we’re slow though is because we’re not very practised at building the trust we need to let go of our past thinking and accept that another way is worth a try. I believe Groupwork Institute co-founder Glen Ochre was right about groups getting better at collaborative decision-making the more they do it. The more work I do in this area, the more I feel that as we begin to do consensus really well, it becomes easier for us to navigate through the tricky bits. We build the pool of trust and goodwill that enables us to let go of our preconceived notions or positions. We create the space we need to be able to take up a fresh approach. Now, to our old friend power. Try as we might we won’t always understand or even see the subtle wielding of power by those who have grown accustomed to having it. Also, we won’t always know who’s not in the room and is therefore silenced, nor how to hear them if they do get an invitation to join us. 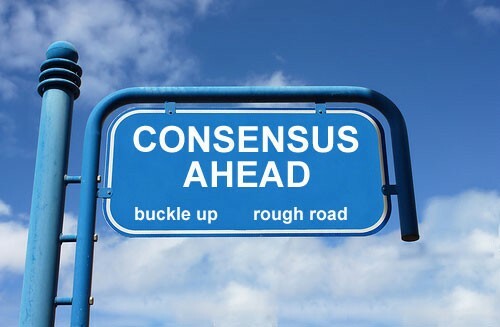 This is probably the biggest obstacle to consensus. Acknowledging this slightly murky truth can be confronting to us if we are used to being part of the decision-making elite. If we are true to our principles and value participatory grassroots democracy, we have to grasp this nettle and do something to equalise power imbalances. We have to build some checks and balances into our processes that have the support of those who feel excluded. Which leads to my last point about reflecting, reviewing and learning from new developments. We put a great deal of effort into making good decisions that serve us well. But our efforts can’t cease when we arrive at that sweet spot of consensus. Everything we make or do needs to be assessed and adjusted from time to time. Decision-making drives the engine of groups and engines seize mighty fast without grease and oil. We have to be prepared to get our hands dirty at fairly regular intervals. How are we tracking? Has the decision panned out the way we planned? If not, what can we do to make it work better? Checking under the bonnet once in a while makes for a safe journey on the team bus. So did we need an agonist to tell us that? Perhaps we did. Sarah Maddison’s contribution is a reminder that we can easily slip into poor practice when we attempt to do collaborative decision making in a rush or without adequate preparation and attention to good process. These are core concerns of the Victorian Greens Facilitators Network. If you are a member of the Victorian Greens, sign up to get on our email list, and to vote in upcoming elections for office bearers. We are now a Working Group of the Victorian Greens and have been allocated a modest budget to conduct training throughout the state. To find out more, visit our web page.